ISU professor and symposium chair John Farrow (right) announcing the day’s program(Credits: Shripathi Hadigal Rao). 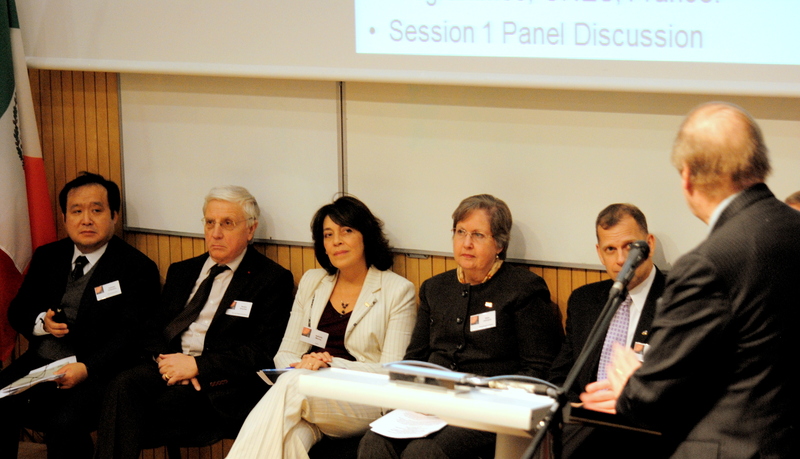 The three-day symposium on Sustainability of Space Activities began on Tuesday, February 21 at the International Space University (ISU) in Strasbourg, France bringing together elites of space industry, academia, and major space agencies. The event will promote discussion of the major issues in sustainability and safety of space activities. The foremost place on the agenda belongs -not surprisingly- to the intensifying problem of space debris. Sustainability, a term applied mostly with regards to exploitation of Earth’s natural resources, first achieved widespread usage in the 1980’s to mean “development that meets the needs of the present without compromising the ability of the future generations to meet their own needs” as defined by Gro Harlem Brundlandt, former Norwegian Prime Minister turned UN Envoy on Climate Change. With a close look into the situation on Earth’s most heavily utilized orbits, concern may be warranted that future generations will have a hard time cleaning up the mess left from decades of human space exploration and utilization. The morning opened with remarks from Dr. Walter Peeters, ISU’s president, and chair of the symposium’s first session “International Perspectives on Space Sustainability.” Peeters summoned the example of the electrical utilities industry as a model for the space industry to follow in that utility companies regularly engage in resource sharing to overcome inevitable variation in supply and demand, long term research regarding how to manage crisis situations, and storage of excess capacity against future need. Peeters challenged the attendees to bring space systems to a similar level of readiness. The need to create an international framework for “space in the period of maturity” was mentioned by representatives of all major space agencies during the opening session along with the need to get space debris under control. General Bernard Molard, the Vice-President for Defense and Security of Astrium pointed out during his talk that worst case scenarios, even though they might seem improbable, shouldn’t be underestimated. Referencing Earth’s environmental crisis as an analog, Molard challenged the complacency of the space community and illustrated how quickly it is possible for near Earth space applications to become completely impossible to maintain – we are only a few collisions and explosions away. 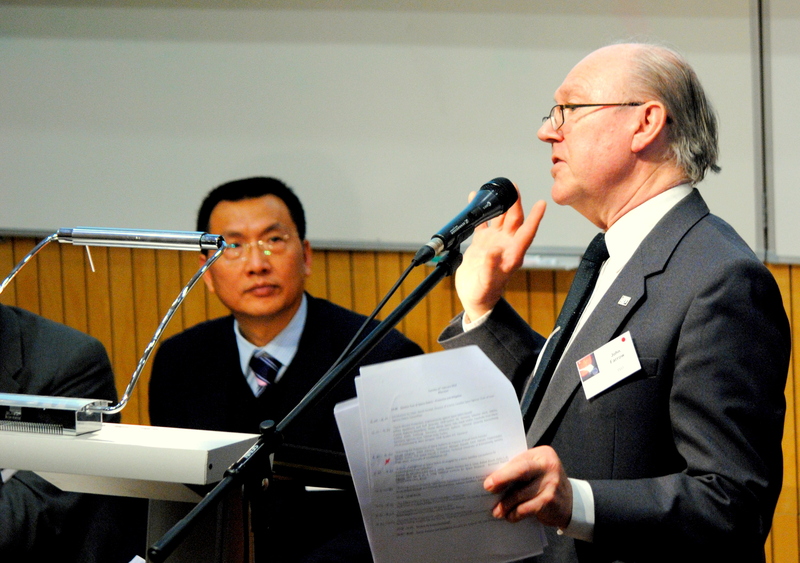 The session “Space Debris – Protection and Mitigation” introduced European projects like P2ROTECT and ReVuS, both of which focus on space debris collision prevention and satellite protection. Speakers explained proposals for faster and controlled re-entry of used satellites, improved shielding and design of spacecraft, quantitative risk analysis of in orbit collisions and avoidance maneuver calculations. The first panel of the symposium discussing international perspectives on space sustainability (Credits: Shripathi Hadigal Rao). The day’s panel discussions were very lively, addressing topics ranging from the need for collaboration between established and emerging space powers, and the gap in collaboration between spac debris specialists and space weather specialists, to details of international liability in the case of microsatellite launches by parties acting without knowledge of their nation state. The afternoon jumped directly into space debris issues of protection and mitigation. Among the proposals and analyses, Marc Scheper of OHB System suggested distributing mission functions across several spacecraft instead of creating a single point of failure; this could be particularly appealing for constellations. The geometry of spacecraft was highlighted as a lever for reducing debris. Scheper referred to investigations by Thales Alenia into increasing a satellite’s area to mass ratio (i.e. cross sectional area), in order to increase atmospheric drag for low earth orbiting craft, thereby decreasing their longevity as space debris. Claude Cougnet of EADS Astrium, identified Synthetic Aperture Radar satellites as a model to study in terms of spacecraft geometry optimization. The cylindrical design of SAR combined with its long axis alignment with its velocity vector create a small profile exposed to debris, reducing the probability of impacts from small debris. Space Safety Magazine staff will be reporting on the Space Sustainability symposium throughout the three days of talks and panel discussions ranging over the areas of international collaboration, space debris threats and mitigations, space weather threats, and cybersecurity. Stay tuned for tomorrow’s report on Space Debris, Space Weather, and Cybersecurity sessions.